Sep 14 The text of that speech by Jeremy on the Palestinian ambassador to the UK, English irony and certain Zionist critics. The pro-Israel blogger, Richard Millett, then challenged the ambassador over his statement. Jeremy Corbyn witnessed the confrontation and, in a subsequent speech, chose to defend the ambassador in the face of what the Labour leader has since called "deliberate misrepresentations by people for whom English was a first language, when it isn't for the ambassador." As you can see from this transcript, Corbyn clearly wasn’t referring to all Jews but rather to Zionists among the political leadership of the Jewish community – and, in particular, to the Zionist activist, Richard Millett, and his colleagues. This was confirmed when Millett himself told the Daily Mail that Corbyn was referring to him, saying that “three days after [the Hassassian] event in Parliament, Jeremy Corbyn said I have no sense of irony.” Millett then reconfirmed this in the Jewish Chronicle (27/9/18). 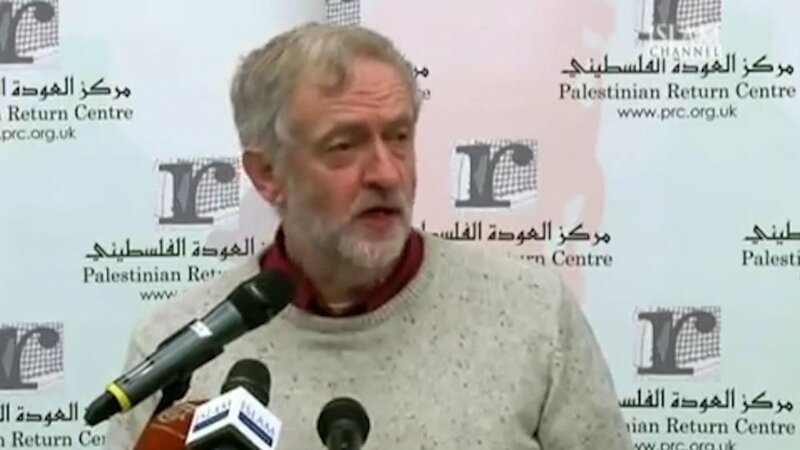 The following is a transcript of Jeremy's speech to the Britain's Legacy in Palestine international conference organized by the Palestinian Return Centre at Friends Meeting House, London, on Saturday January 19, 2013. I will be very brief because I've been asked to do seven minutes and I will try and stick to that. Firstly, I want to say a huge thank you to the Palestine Return Centre for its establishment and its work over many years and for giving a very solid base of information, understanding and support for Palestinians and Palestinian history and the cause surrounding it. Because it's actually very important that our supporters don't just go down the road demanding, as they must, freedom and justice of Palestinian people but have a serious understanding of how this oppression of Palestinian people came about and how the division of the people came about. Understanding of history is something that guides people throughout their lives and it's why I'm absolutely passionate that if I had to have only one core subject on every school curriculum in every country in the world it would be history, not anything else, because understanding of history is absolutely crucial to so much that we do. I loved the way that Manuel put the last part of his contribution, when he said that the Palestinian people don’t have to bear responsibility for Europe’s guilt for its treatment of Jewish people during the 1920s and 1930s. It is extremely well put. And I recall taking a group of fire-fighters from Jenin on a visit to Parliament a couple of years ago. They were guests in this country from the Fire Brigades Union, who have done fantastic work in this country in solidarity with the Palestinian people. So I took the Jenin firefighters around, and they were impressed by the building, impressed by a lot of what they saw. And at the end of the tour we got into the members’ lobby of the House of Commons and they said who are these people on those statues? And so I deftly managed to ignore the presence of Margaret Thatcher’s statue until they asked who that woman with the handbag was and I was forced to explain. And I pointed out all the others and I thought we’d finished. Then just as we were leaving, one of them said to me “Who’s the fellow over there by the door?” And I must say I’d walked past this statue every day for nearly thirty years and I hadn’t really noticed it and never thought about it very much. And so I went over and looked, and it was Balfour. They immediately formed a squad to tear the statue down and take it away piece by piece. And so it’s that understanding that’s so important. And when Balfour wrote that fateful letter – and it really is a sort of not particularly well-drafted, very short thing that he wrote – the interesting thing was that the progressive Jewish element in Britain, including members of the then Conservative and Liberal coalition government opposed it on the basis that it would only bring problems for a lot of Jewish people. And remember at that time the progressive leadership in London of the trade unions and the Labour Party, and to some extent the Liberals and many others, was actually Jewish trade unionists and the Jewish people in the East End of London. It was Zionism that rose up and Zionism that drove them into this sort of ludicrous position they have at the present time that, for example, the other evening we had a meeting in Parliament in which Manuel made an incredibly powerful and passionate and effective speech about the history of Palestine, the rights of the Palestinian people. This was dutifully recorded by the, thankfully silent, Zionists who were in the audience on that occasion; and then came up and berated him afterwards for what he had said. They clearly have two problems. One is they don't want to study history and, secondly, having lived in this country for a very long time, probably all their lives, they don't understand English irony either. Manuel does understand English irony and uses it very very effectively. So I think they needed two lessons which we can perhaps help them with. But we have to then look in the period in 1917 when the Balfour Declaration was written. At that time even the very farsighted and very smart people – and don't underestimate them in the then Colonial Office and Foreign Office – they could not have known that at the conclusion of the First World War would be the Versailles Conference, it would be that sort of frankly abominable process where they sat around the table and calmly divided up the colonies of the defeated nations and handed them out as mandates. No different really to the 1884 Congress of Berlin that calmly sat around a table and divided up Africa between the conquering powers. They could not have known at that stage that the mandate territories would be divided up across the region and France would get some and Britain would get others and then the dishonesty, the deception, the lies of the Balfour Declaration came home to roost, having promised one thing to the Zionists and another thing to the Palestinians, they then proceeded to divide and conquer which is of course the fundamentals of all empires. And I'm sure many of you have been at various times in Jerusalem. It's quite instructive obviously walking around East Jerusalem and the beauties of the old city. But it's also instructive to go to West Jerusalem if you're able to and see the buildings that Britain put up in the 1930s at a time of unbelievable economic chaos. At this end of the Empire there were nevertheless building buildings to last. They were building a colony to last for a very long time in exactly the same time that Lutyens was designing New Delhi and the eternal Empire in India. It all came crashing down around their heads only a few years later and that vile oppression of Palestinian trade unionists, progressive opinion and the denigration of Palestinians and their history. I was brought up being told at school that Israel was founded on a piece of empty space and that they managed to make the desert bloom and they built things there when there was nothing there before. Anybody that studies the history of the region will know that at the end of the Second World War, 1945 to 1948 period, Palestine had media, had industry, had education, had universities, had a relatively high standard of living for the whole region and was a coherent society and a coherent state. It was a denigration of that which enabled Western opinion to be put together in support of Israel. I noticed later on today a very interesting session I'm hoping to get back in if I can for it, I'm not sure. And that is “The Implications of the Mau Mau case for Palestinians” which Martin Linton is going to talk about because what needs to be done in this country is an understanding of what the brutality of empire is all about. Britain took part in the partition of Africa. Britain took part in the slave trade before that. Britain took part in the Mandate territories in the 1930s. And even at the end of the Second World War – a war fought against fascism, a war fought for democracy, for peace, for freedom, we are told – Britain nevertheless in 1945 was straight at it joining in with the oppression of the Vietnamese people in Vietnam, in Indonesia, in Malaya and crucially in Kenya. But these things come home to roost and there was some kind of historical epiphany for me sitting in the High Court earlier this year with the Mau Mau people who are making their application for justice and compensation for what happened to them in the 1950s in Kenya when they were tortured, murdered, brutalized, castrated, every kind of vile piece of treatment you can imagine. And put in concentration camps that can only be akin to Nazi concentration camps. They had their day in court and they won their right of application for appeal and that is going to go ahead hopefully very very quickly. They are very very old people but I just thought fair play to them for being able to get it to that state. So we need to understand, and everyone needs to understand, far more about the history of the way in which the Palestinian people were divided and sent to the four winds. But it hasn't worked because that sense of unity of Palestinian people, be they in refugee camps, be they within the 1948 borders, the West Bank or Gaza or indeed anywhere else in the world are making their voices felt. We've won that vote at the UN, we've gained such a huge level of public support in this country, in many other places because of that sense of solidarity. But we need to teach the next generation to understand the history of the brutality of colonialism, the brutality of occupation, brutality of partition and at the end of the day it ends up brutalizing yourself because you have to have oppressive laws in order to maintain the oppression elsewhere. It's not a liberation to oppress other people, it's an oppression of yourself to oppress other people. So let's understand that history and that this conference today I think is an absolutely fantastic event that we're having and I really do admire and applaud the work of the Palestine Return Centre because building those blocks of knowledge and support is something that we will all benefit from for decades and decades to come as we move rapidly towards the final denoument which will be the liberation and unity of all of the Palestinian people. Thank you very much. This journalistic failure is reminiscent of the recent stories about Corbyn hosting a talk by the anti-Zionist holocaust survivor, Dr. Hajo Meyer, back in 2010. At this event, eye-witnesses reported “the 'hounding' of 85-year-old Dr. Meyer, and the bellows of 'boring!' every time a survivor of a different genocide tried to tell about their experience” (Amanda Sebestyen, London Progressive Journal 12 February 2010). One pro-Israel protester apparently even shouted 'Seig Heil' and gave a Nazi salute. Yet no journalist saw fit to report any of this! (Press statement from the International Jewish Anti-Zionist Network UK, Feb 2010). Sep 15 A campaign against local government austerity?